Home > Birth & Baby Finance > Why Start a Pension for Your Children? Up until 2001 when the Government introduced stakeholder pensions for children, the whole notion of discussing pensions and children in the same sentence would have sounded ludicrous. 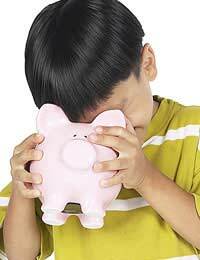 Before then, if we wanted to put some money away regularly so that our children could have a decent start in life when they neared adulthood, we’d have simply opened a savings account for them or maybe considered a child trust fund. However, due to the potential returns on a child pension, many people are now taking these out for their kids to provide a far more financially lucrative option than what was previously available to them. Studies have shown that, on average, a newborn baby receives gifts worth around £600. If you were to take this figure and add monthly child benefit of around £75 to the pension pot until your child reached the age of 20, he/she could retire at 65 with a pension fund of £618,000 and all without ever having made a contribution themselves. This could equate to an annual income of £39,000 a year at current annuity rates. And, although both children’s pensions and child trust funds earn tax free interest, the pension also receives tax relief which will boost the pension fund even further. Another consideration when looking at child pensions versus child trust funds has to be the access to the funds. With a child trust fund, it can be accessed from the age of 18 whereas a child pension can’t be accessed until you reach 50 (this age limit is also set to rise in 2010). Whilst this may not be the kind of news your teenage child wants to hear as they approach their 18th birthday, some parents might gladly welcome it as it means that their child won’t be able to squander the money which has been set aside for their future and blow the lost before they even reach 19. In fact, many parents might consider that to receive such a big payout later in life is a far better alternative given the fact that funding in retirement can often be difficult for many of us. Children’s pensions can be opened with as little as £1 and can be contributed to by others as well such as grandparents and other relatives and friends. And, if you don’t have your own children, you can also set a pension fund up for, say, a niece or nephew if you are a benevolent auntie or uncle. There are many different pension providers for children on the market but, just as you would do with any financial investment, it’s important to establish how the pension will be governed, whether its approach to investing is one of low or medium risk and make sure that you check the small print. You should also ensure that you fully understand the terms and conditions of the policy before making a financial decision of this nature as it is bound to have an important bearing on your child’s future.